When it comes to matters of the sea, it could be argued there are no true masters. She remains an elusive and mysterious beast, with many qualities we don’t understand. Yet, if you’re willing to be patient and listen carefully to her moods, she might just teach you something special. If you’re keen to learn the art of sailing, don’t forget even the most hardened seafarers have to start somewhere. Keep your eyes peeled, your ears open, and respect the power of the water. The only other rule is to have plenty of fun because sailing really is an incredible hobby. This article explores some of the things to consider before heading out on your first sailing adventure. Before you start browsing the catamarans for sale, it’s worth spending time in a small, pure vessel. The multihulls are, of course, what everybody wants to get hold of, but they can be bulky and unwieldy in the hands of a first-time sailor. You’re advised to start with something small and work your way up. One example might be a 22’’ keelboat. This is what many sailing courses are taught on, as the vessels are more abundant and tougher than dinghies, but still very compact. Again, if this is your first time at the helm of a sailboat, it’s best to avoid complicating factors like turbulent weather. Obviously, you can’t control what happens after you get on the boat, but picking a calm, tranquil day is advised. Keep your eyes on the weather forecast. The ideal conditions are relatively calm seas and lighter, gentler winds. Sunshine isn’t essential, but it’s a nice bonus. Even if it is a very sunny day, make sure to pack warm clothes and a thick jacket. It is much more relaxed out on the water than it is at the shore. The boom is a big, massive bar that sits at the foot of the mainsail. It arcs right across the boat whenever you gybe or tack, so it’s imperative that you know where it is at all times. Otherwise, it’s going to hit you and potentially even knock you off the boat. If you’re sailing with others, stay well out of the way (down in the cockpit, perhaps) whenever it’s time to tack. Once you start to build up your skills, you’ll learn to control the movement of the boom, so it’s not swinging wildly across the boat every time. 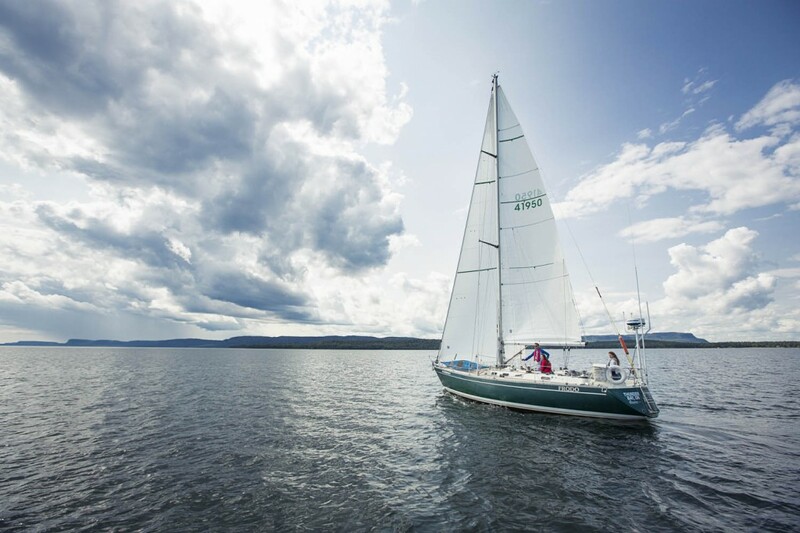 Before you head out, make sure you’re familiar with the basic sailing terms. You should know the difference between starboard and port and be savvy about the points of sail. The more knowledge you have, the more comfortable you’ll be out on the water. When sailing with experienced individuals, it’s easy to feel left out, mainly when they’re talking nautical jargon and throwing unfamiliar words around. Doing a little learning not only helps you develop as a sailor, but it also allows you to contribute to the onboard dialogue. Try to have realistic expectations for your first trip. Most importantly, don’t try to push things too far, too soon, because you’ll forget to enjoy yourself. Have fun just being out on the water and getting used to the whims of the waves. Sailing is an exhilarating experience. For most, that first foray out into the water is the beginning of a long romance. So, take things slow. There’s no need to rush. Get comfortable, explore your abilities, and work out whether a salty seaman is hiding inside you. It’s often assumed sailing is a hobby for wealthy folks. While it certainly attracts a luxury crowd, with a penchant for sprawling beautiful yachts and catamarans, there are lots of ways to get your hands on a boat. The first step is finding a certified training school in your local area and signing up for open water lessons.